This thread and project inspired by afet 's thread Dwarves riding goats and posts by Cardstock Dane , arcticdragongames and Vermin King. Anyway so here's my contribution - charging ram, which might be used as "classic" Battle Ram but also as a "steed" for chariot. These are not perfectly finished versions and couple of ideas are still in developing, but it can give you some impression. It's of course possible to convert this ram into version with distinct A and B sides and even 2.5D. Then some accessories like saddle-cloth or some armour could be added. Hmm... this could be also nice - and here looks kinda "demonic"! so you can browse through some mine old threads - PDF should be still available. Firstly - let me know your impressions and thoughts regarding such common project (perhaps nobody's interested?) and then showed respective components/parts. All these components could be posted as both JPG and TIFF hi-res versions (for those who might want to take a challenge and do brand new colouring and texturing:) - as a FREE for non-commercial use (some credits would be always appreciated though;). So you will have most of the components needed to assemble your own chart - then only riders (dwarves!) would be missing. 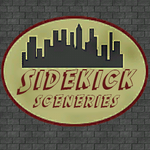 Of course nothing would stop for using any other minis available for you or your own components and mix these according to your ideas and needs. Actually it would be a lot of fun (and perhaps some good practice for CWF members and readers as well) to see your finished, modified chariots. You could post these in this thread as ready for download PDF (or any other reasonable format) for other members, and/or post some pictures of your versions! So... everybody is welcome to join!!! Time to smash some Goblins! The Grey Mountain Grogmeisters want to put in an order for some goat drawn chariots. I think the chariot needs more iron. These are dwarfs, right? I love these! And I agree with the 3D chariot. Going to the US tomorrow - but when I get back, I will attempt to make a chariot model to fit the goat. (it will probably have fixed wheels). I agree that dwarves would use metal of some kind and metal would make spoked wheels a natural choice. Four spokes looks flimsy (though they did exist in ancient Egypt) and I think eight spokes looks heavy. I suggest six spokes. How about the one below for a start? Surviving depictions from ancient Scandinavia seem to always show four wheels, but that to me seems to lack the maneuverability needed for battle. I think the chariot needs more iron. Agreed, I was just inspired by "Valhalla" comic wooden cart. OK, time for some test mock-ups. As Roman chariot cars was used in this version, so instead of a Roman "wings" emblem some dwarvish-style ornament should be used. Wheels should be replaced with some more massive, with more metal "dwarvish style" ones. Perhaps it might be good idea to add full-metal wheel with some dwarvish runes or inscriptions/signs, maybe some golden plated ornaments etc. Then of course final version should be "normal" (ie not overlapping) and in much better quality/resolution. Additionally I'm usually doing special B-side for a wheel, so "internal" side (the one close to cart or other vehicle) is darker and with different shadows/lights so it looks more realistic. In your image of Norde Battle Ram Wheels, I really like the one in the middle. 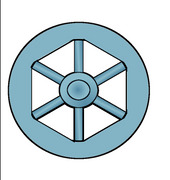 It is overlapped by the wheel to the right and the logo. I actually picture using this wheel, but making the spokes of iron. Is it possible to get just an image of that wheel? And if you have a darker version of it, that would be great! 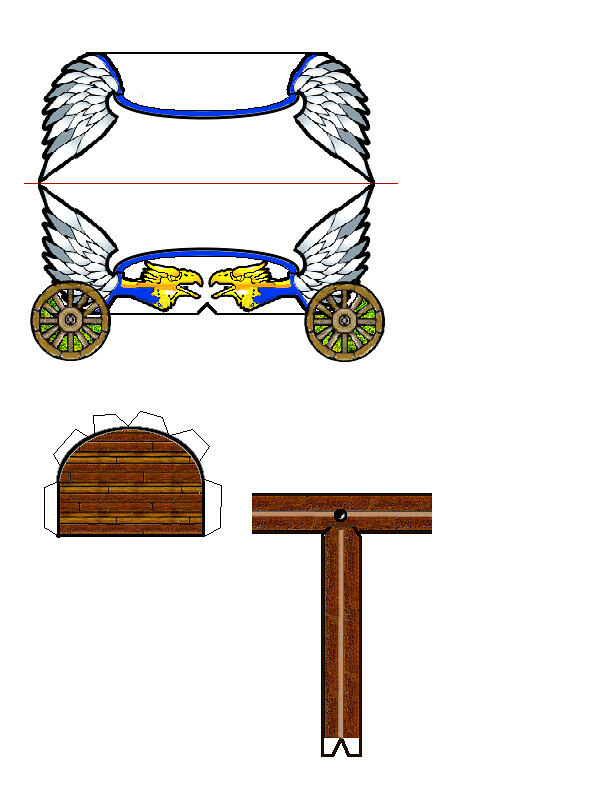 Cowboyleland, I compared that to the vintage Roman chariot, I was thinking of using as a base for my design, and they are very similar, but the Roman one doesn't have wings to work around. Let me know if it helps and if you will need any assistance (like changing format, resizing)? <...> I actually picture using this wheel, but making the spokes of iron. Oops! Forgot about iron spokes! Actually you can recolour or replace original spokes, then I can also send you version WITHOUT any spokes or spokes as LINE-ARTS (so you can fill them with your own colours) - or I can recolour these in case of any problems - just let me know. I download and then opened downloaded file (using Photoshop) just after sended the post. Here is an alpha from me. I think this has gotten this project out of my system and I will try to concentrate on my Hoard submission from here on in. And you have the wheels to the back... like a chariot. I'll have to take a closer look at that. Since I had originally thought of using le Roman Char as the base, I was cleaning it up. Might as well have a Roman chariot, as long as I'm working with it. BTW, I played with putting a Dwarf on the page to see how much reduction in size I should do. Would a Dwarf chariot be about 2/3 of a human chariot in size? a 2/3 reduction of height seems about right. Width probably the same as for humans. I think width may also need reduction. We are talking goats as steeds, and even those powerful War Goats would probably need a weight reduction to be able to pull the chariot at speed. I know Egyptian chariots were quite speedy, but not substantial. Roman chariots were more substantial, but not as fast. I'm planning on a box-axle underneath to attach the wheels. Once I get the Alpha done on this, I imagine folks might want to come up with weapons that fix to the chariot. Could be a lot of fun. Also, I am glad that Eric gave permission to use some of his steam ram textures for the body of the chariot. Thank you, sir. Okay, who's been watching Ben Hur? Actually the book I referenced above stated that the chariots of the ancients were pulled by horses that were smaller than their more modern ancestors. Come to think of it, a reduction in width does seem fitting for Dwarves, as everything in the chasis (cab? ), such as the reins, arrows, spears, anchors, etc. should be within easy reach of their shorter arms. The great thing about Fantasy creatures is that the goats can be steroid chomping monsters! Well, good enough to finish the build, but not a truly successful test. I have figured out what needs to be changed and how I want to do it, but it is late and the Royals are losing, so I am calling it a night.